Co-hosting the show tonight is your usual guy Nick Schofield, plus the wicked wiles of Rachel Weldon, CKUT’s Arts & Culture Assistant/founder of Debaser. Together we’ll be tackling an interview with Lido Pimienta in anticipation of her #mtl show this Satuday (Jan. 31) with Gambletron and Mas Aya. And, it only gets better, Moss Lime (Fixture records) is stoppin’ by the studio with their geetars for a live performance. This local trio has been making our charts sweat all winter, so now’s your chance to hear them like never before, live on the radio. This entry was posted in CKUT programming and tagged fixture records, lido pimienta, moss lime, Underground Sounds on January 26, 2015 by librarian. When you think of successful talented Montreal artist, Richard St-Aubin aka Dj Sash’u is an essential reference. Really well known in the Montreal urban community, his work has allowed him to perform at major events like Juste Debout in France, as well as Igloofest , PikNik Electronic and Boiler Room in Montreal. His interesting discography shows that he has crossed genre borders to end up with a unique sound that he qualifies has Power Funk (PWRFNK). Here we are today with another new project from him, Thru Da Night EP. Released under Fool’s Gold Record on January 13th, Shash’U spoiled his fan base and music connoisseurs with a free five track project. The EP was really well received on an international scale, with major platform like Complex Magazine highlighting his work. Shash’U did put Montreal on the map and made us proud. So what should you expect listening to Thru Da Night? Electric, funky and soulful sounds. Keep reading for a track by track review. The EP starts with the song “Don’t Fight It“, which takes you through the 80’s in about one second, and almost makes you believe the tracks could be the theme song to a classic TV show (think Knight Rider and the A-Team mixed together with extra drums and bass: marvellous!). 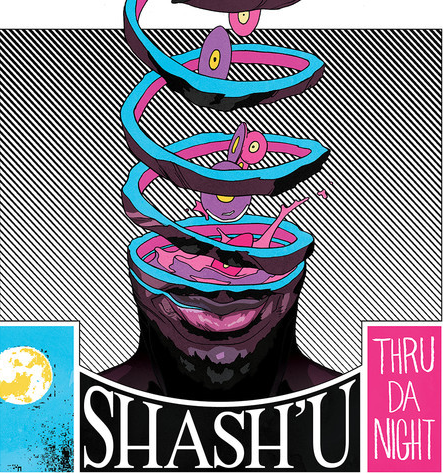 Quickly enough Shash’U takes the listener to a whole other universe pairing his talent with another great Montrealer; Mrs Mimo LaFunk for the “Song Thru Da Night.” The song was actually released on his Youtube account about 2 months ago with a very dope visual; check it out : https://www.youtube.com/watch?v=u3Pw5trVhx8 ). “One More Ride” will take you to a funky electronic Carnival vibe! This track will flip your mood if you are down and the good energy from the song transcends your entire body. “Lol XoX” keeps us at the party with some more ‘’headsprungy’’ notes, alongside heavy drums, and subtle cross fader magic/scratching at his best. “Skyline” is a great closing track, with a little slower tempo, it’s certainly the darkest song of the project, but still really enjoyable. To conclude; with a very strong mixture of sounds, Shash’U is giving us a bit of everything in this 5 track release to satisfy all the moods and all the listeners – but, still staying faithful to his unique sound. A must listen ! This entry was posted in CKUT programming and tagged album review, shash'u on January 26, 2015 by librarian.